You’re walking on a country path. It’s a sunny day; you’re at the edge of a reservoir and your dog – a black and white springer spaniel – it’s straining to get to the cool water. There are grassy hills all around you and no one else about except for a solitary fisherman a few yards away. The sky is blue and the mountains in the distance a dark hazy green. A perfect afternoon. Now, change a single minor detail: instead of the springer spaniel, at the end of the lead you have a hybrid wolf whose hackles come up to your hip, whose head is a third bigger than a German shepherd because his brain is thirty percent bigger, and whose back muscles are so powerful that there are two of you hanging on for dear life to the twenty foot lead. As he pulled to go forward, the panting from the wolf was deeper than a dog’s because their lungs are larger and their voices darker. It was an exotic sound and, for the first few minutes, not a little menacing. A week ago I went walking with wolves, and it is not a metaphor. 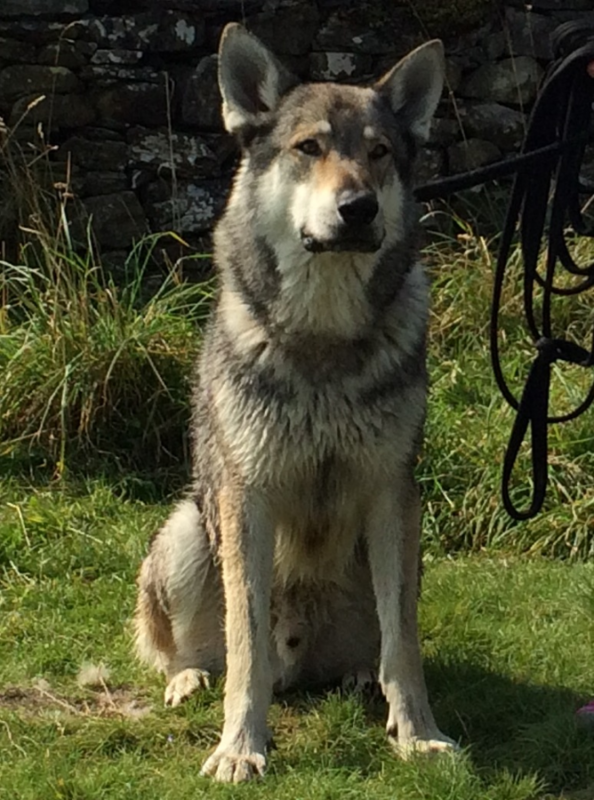 By the way, the wolf – Maska – was only humouring us by allowing us to hold the lead. We knew – and I think Maska knew – that he could shake us off in a nanosecond and go off his merry way. My theory is that he did not out of respect for his two handlers and out of pity for us puny humans who had apparently joined his pack for the afternoon. Why was I holding a strap attached to over 70lbs of wolf? Because I write novels set in the Pacific Northwest of the U.S. and they have wolves there. My character, Alice Madison, is a detective in the Seattle Police Department Homicide Unit but a good chunk of the stories is set in the wilderness, in the forests of the Olympic peninsula and in the mountains on the border with Canada. Their wilderness has no comparison with ours and when I found out I had the chance to meet a wolf – two, actually, four year-old brothers – there was no way I would not. 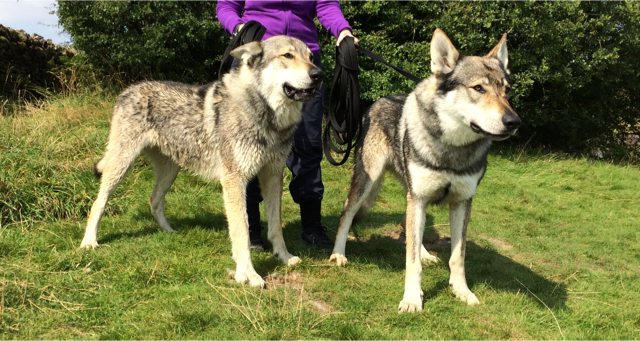 Maska and Kajika’s owners/handlers have had them since they were puppies and have treated them like the wolves they are and not tried to turn them into pets (they are mostly wolf with a tiny genetic bit of wolfdog which makes it legal for us to meet them in this open manner). There was a structure to our meeting: first, we had to be sniffed so that they would know who we were. Normally a wolf would greet another member of the family by licking around their face and mouth but since Health & Safety would have something to say about that kind of introduction I put my hands flat against the metal mesh at the back of the pick-up truck and the wolves darted forward and pushed their noses close to my skin. When the door was opened the wolves jumped out so quickly it was a blur of grey fur. The first surprise was how big they were, the second how unlike dogs they behaved: dogs want you to like them, they interact with you and are determined to make friends – people made sure they behaved that way through centuries of breeding for that particular trait. Wolves don’t care about making friends. Maska and Kajika were more interested in the surroundings, profiling the ground and the bushes around us, looking for voles and other small creatures that might cross their path. They were aware of everything, especially of each other. Kajika always walked a few feet ahead of his brawnier brother because he was higher in the family hierarchy. If we let Maska lead the small group we were told that the brother would put him in his place later. We were told that they are so close they would never stray more than a hundred meters from each other. Once we were on the path and away from the road we were given the leash to hold and we started walking together. I asked if it was okay to touch them and, yes, it was. The tips of my fingers brushed the thick coarse fur. Maska did not react at all, he was heading for the lake and I was merely along for the ride. For an hour we watched them run, dive into the water, play with each other and roll into the grass to dry themselves. On the way back, Kajika stopped by a gate and peered at a few cows at the other end of the field. ‘No, we don’t eat the cows today.’ Her handler said and gave a strong pull of the lead to let him know we should move on. The brothers eat four and half pounds of meet a day as it happens and need hours of exercise to keep them happy and interested – you really don’t want a bored wolf on your hands. The truth is that it is far more likely to be bitten by a dog than by a wolf that would only attack a person if he felt the person presented a danger to the pack. People get bitten, and worse, by dogs all the time, sometime their own dogs. The myth of the big bad wolf is still out there but for my part I found them a true marvel: beautiful and powerful, self-contained and yet bound by deep familial bonds; we even got to hear them howl when we said goodbye – the family bonding howl. Amazing. I walked with wolves. I’m glad for the pictures I took or it would seem like a dream. Maska and Kajika live in the ‘Predator Experience’ Zoo in Cumbria and their owners Daniel Ashman and Dee Ashman have years of experience in animal management, especially birds of prey.